When 17-year Lani Deauville dove from a seawall on a Jacksonville, Florida, beach in 1958, it didn't seem particularly risky. After all, the athletic champion diver was used to diving from bridges, racing cars at high speeds and generally, as Deauville remembers, "performing any scary activity I could think of" With this particular dive into shallow water, however, Deauville slammed hard into the ocean floor, breaking the fourth, fifth and sixth cervical vertebrae in her neck. 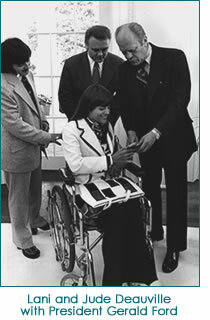 In 1980, Deauville became the first female and disabled person to be the Director of the Florida State Vocational Rehabilitation Agency – the very agency that was responsible with her own rehabilitation years before. But the recurring illnesses that tend to plague quadriplegics were attacking with increasing frequency, and were exacerbated by the fact that a very busy Deauville wasn't eating healthy food or getting enough exercise. In 1987, after retirement, she broke a hip and suffered from several infections. "Each hospitalization saw me ending up worse off than before," she remembers. Everything changed in the late 80s when Lani's husband, Jude's brother-in-law, Sam Graci, a Canadian biochemist, had been developing a highly nutritious "green drink" made up of superfoods that he thought might help improve Deauville's health. "Sam used me as his favorite guinea pig," says Deauville. He continued to refine the powder into a supplement – mixable with juice or water – that became known as Greens Plus. "I've been supplementing my food intake with this formula for 19 years," says Deauville, "and it has totally transformed my life and health. After suffering numerous hospitalizations for more than 30 years, I can say that I've not had a major illness in years, and I am healthier today than I've ever been." Greens Plus is a whole food supplement consisting of 29 enzymatically alive foods. Each serving of Greens+ is equal to five servings of fresh fruits and vegetables. It helps to support the immune system, provide increased natural energy, strengthens mental acuity and cleanses and detoxifies the body. In 1991, Jude A Deauville & his wife Lani began distributing Greens Plus to their family and friends, and – eventually – to health-food and healthcare professionals in 19 countries worldwide. Today, a variety of other supplemental products based on Greens Plus are available, including the Chia™ product for cooking (see recipes). Given up for dead more than 50 years ago, Deauville has managed to beat the odds. In the process, she's lived a fulfilling life that has included improving opportunities for other disabled. At 70, she credits her longevity to healthy eating, Greens Plus supplements and exercise (she lifts weights twice a week and swims regularly). 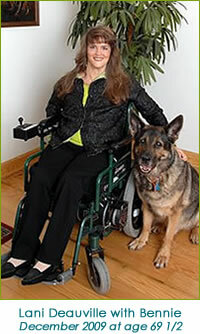 Along with all of Lani's other achievements, she has been awarded with the Guinness World Record for longest living quadriplegic! With no regrets, Lani passed away peacfully at her home in July of 2012.